WHO ARE YOU? SINCE YOU MAKE NO MONEY, WHY ARE YOU DOING THIS? Rettav, Sandy and Gail volunteer their time and efforts from a desire to help Central Texans become philanthropists… painlessly. Together, they have served on over 50 non-profit boards of directors and understand the desperate need for funding. DO YOU PICK UP ITEMS I WANT TO DONATE? Yes, if they are items we can sell and are located within a reasonable distance from our facility. WHAT IF YOU CAN’T SELL MY ITEMS? After a reasonable time period, unsold items are donated to either the Settlement Home for Children or the Assistance League. Either contributed or sold, the items are out of your home and out of your life – and are gone to do good. WILL I BE NOTIFIED BY THE CHARITY WHAT DOLLAR AMOUNT THEY RECEIVED FROM GONE FOR GOOD? DO YOU PUT A DOLLAR AMOUNT ON THE RECEIPT FOR THE IRS OR IS THAT UP TO ME? The value of your donation is up to you to determine. There is no guarantee how much we will receive from the sale. IS GONE FOR GOOD A CHARITY, AND WILL I GET A TAX RECEIPT? 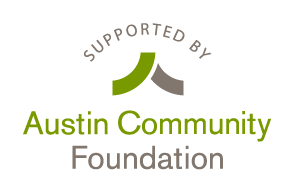 Gone For Good is a fiscal sponsorship fund under the umbrella of the Austin Community Foundation. All donations ARE tax deductible. YOU MEAN IF I DONATE AN ITEM, AND YOU SELL IT, GONE FOR GOOD WILL SEND THE MONEY TO THE CHARITY OF MY CHOICE? Yep, less a handling fee retained to cover expenses. At the end of the year, if monies are left after expenses are paid, Gone For Good will grant out the remainder to non-profits whose annual budgets are under $100,000 through an application process. We don’t! We are an all volunteer organization. HOW CAN WE INCREASE FUNDING FOR CENTRAL TEXAS CHARITIES AND HAVE FUN AT THE SAME TIME? We turn valued items into dollars for charity, and YOU can help spread the word! WHO’S BEHIND THIS FRESH WAY TO GIVE BACK? Gail K. Miller and Retta B. Van Auken teamed up and created Gone For Good in 2010 out of their desire to increase funding for Central Texas charities and have fun at the same time. Sandy W. Rotman and her designing skills joined the effort two years later. Meet Gail, Retta, & Sandy.